The highly anticipated new Toyota Supra will share a platform with the upcoming BMW Z4 in a fascinating collaboration between two companies with very different cultures. Moto Miwa from Toyota enthusiast blog Club4AG compiled interviews with the Supra’s chief engineer, Tetsuya Tada, and shed light on just how different those cultures really were when it came to designing the two sports cars. The blog—which draws from an interview by Japanese car site Holiday Auto, as well as from Miwa’s personal discussions with the chief engineer—describes how the partnership began in the first place. According to the story, Tada says BMW approached Toyota during a European press event in 2012 for the Toyota GT86, and suggested that the two companies collaborate. Apparently neither had a specific project in mind. 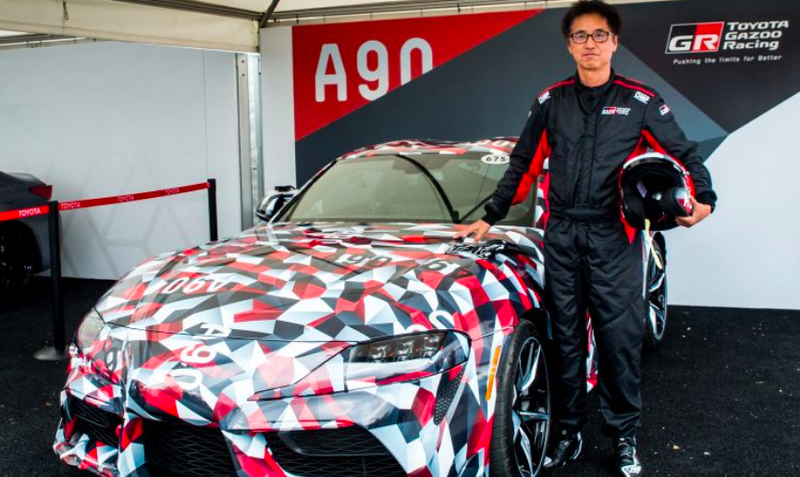 But remembering CEO Akio Toyoda’s wishes to give the GT86 a big brother and a little brother to create a lineup of three (to mimic the Supra, Celica and MR2 trio of the past), Tada suggested co-developing the next Supra. And so it began. When we compare the previous collaboration with Subaru, this time it was much more of a challenge. The cultural barrier of German engineers, proud of their engineering, and our pride of what we do best collectively as teams from each firm was something astonishingly different. I won’t get into much detail today, but even simple things had very different approaches, and thinking. We’ve learned a lot from BMW. The task list of each step in car making they expended on R&D was impressive. I almost started to think if they had an infinite budget funding to the task of design. Each step just much more extensive (and expensive) than what we would normally expend in different areas. Just astonishing. I started to doubt myself if this whole thing can be accomplished in a manner that can profit as a product sold as a Toyota. ...BMW couldn’t believe how extensive some of our quality and efficiency studies were as parts came into shape one by one. We would take every bit down to a fastener or rivet, and put it through our stringent quality control and a dozen other testing, we’d ship thousands of parts back to Japan for analysis. That is normal to us. Each piece we test at our level, they were now the ones surprised. ...they wanted to design a package, and from there they would naturally evolve a shape and size of the body from that packaging, a functionally oriented goal. They’d often say to me, “the car will shape itself, as we put in the equipment where it needs to go.” And they will spend a great deal of time in how to mechanically package this. I mean a lot of time. Our company (Toyota) with my tenure and experience, the focus was always design elements being the priority. We would first spend a lot of time on the shape and appeal of the car from visual perspective and adjust based on where mechanical things fit or how our assembly lines can be efficiently used. Check out the rest of the story on Club4AG. It’s filled with interesting tidbits like how Toyota’s benchmark is the Porsche Cayman, how Tada actually deliberately drove the car in a low gear to let folks at Goodwood listen to the motor, how Toyota designed in provisions to make the car modifiable as a race car, and lots more.